Hundreds of thousands of people are still homeless in the Philippines as a result of the devastation wrought by Typhoon Haiyan last November. Now, a Filipino-American businessman has come up with a solution which he hopes will help solve part of the problem in the Philippines and other disaster-hit areas. The Butterfly House is a low-cost, foldable, steel-framed single unit that takes less than 15 minutes to open up. 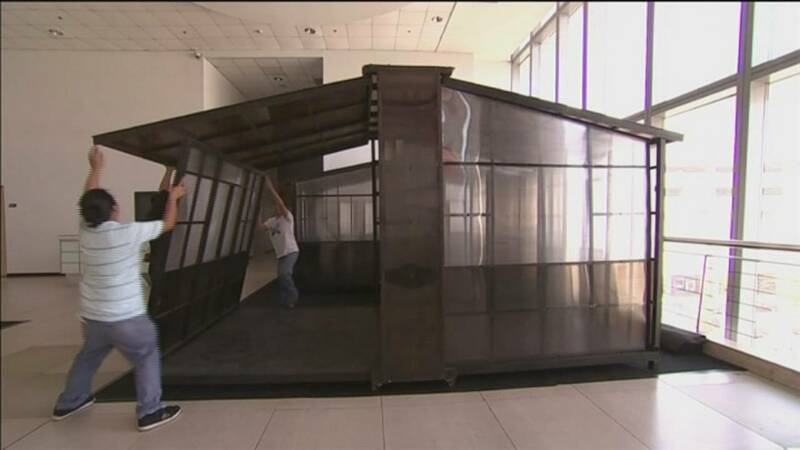 It is 11.5 metres square and costs about 800 euros. A larger version includes a bathroom, and the top of the range house – the ‘Monarch’ – is 26 square metres and has a 2.6 metre high ceiling. “What makes the butterfly house unique is that it combines the ability to respond quickly to a disaster scenario but at the same time it is also a full steel frame structure which means it is a highly durable structure, it gives the people a sense of stability, a sense of safety when they are in it,” says Rogelio “Vonz” Santos Jr, the inventor of the Butterfly House. The wall panels are a choice of bamboo, cement board and marine plywood, which don’t conduct heat. There are also several windows to ensure cross-ventilation. Although designed for disaster response, the Butterfly House can become a permanent home once concrete is poured on the footprint. “The value of this butterfly house is that it is an instant quality house during a disaster. This is not something that you will receive, just because it is disaster time, you compromise the quality,” says the designer of the house, Royal Pineda. The goal is to mass-produce the butterfly houses for bulk orders. Five thousand units have reportedly already been ordered.